Storing food on a boat is always going to be dictated in part by how much space you have in the galley area of your boat and in any other spaces you can free up. If you’re permanently moored not too far from a supermarket or general store, it may not too be much of a problem as you’ll simply buy as you go along but if you’re on a longer cruise or out on the open seas, there a few things you might need to consider. Keeping food cool is an entirely different proposition altogether and more detailed information can be found in another article on this website which looks at refrigeration options but there is also some additional information here. If you’re off on a long voyage, the types of food you’ll store will have a large bearing on how much food you can take. Therefore, the longevity of the food you buy in terms of how long it will keep before it goes off is something you might need to consider. Canned food or food contained in jars is always a good choice as they will stay preserved for a long time. However, with things like bread and milk, for example, tortillas which are vacuum packed and UHT or dried milk are going to be better options than fresh bread or fresh milk. So, if you’re not going to have access to food stores for quite some time, you’re going to have to adopt a somewhat similar approach to that of an astronaut. You’ll also want to store the most frequently used items near the front of any cupboards in the galley so you can get at them more easily. So things like tea, coffee, sugar etc are good examples of that but you’ll also have your own preferences. Also, when it comes to space, remember to discard any packaging you can get rid of before storing the item. A box of cereal is a good example. As you eat more of the cereal, the storage doesn’t decrease as a result if it’s still in the box, so by taking it out of the box and just storing it in its plastic inner sleeve, as you eat more of it, the space for storage will lessen. If you’re sailing around a lot, you’ll not want lots of small separate items as they’re more likely to become unstable and when you open the cupboard door, something will be bound to fall out. Therefore, separating certain types of food and putting them in a number of larger plastic containers marked appropriately is a better storage option. For example, you could have one with all your tinned foods in one container and have another one with all your glass jars or you might have your own ideas of which groups of foodstuffs should go in which container. You might need to play around with different types of containers of different sizes and perhaps some will be rectangular and some may be round to make the most of the available space you have in your galley cupboards and, of course, you can always store certain items behind any sofa or in a bedroom closet, for example, and just bring them out to the galley as and when you need them, although it’s only things that won’t give off a smell such as canned goods and those in jars where you’ll be able to do this. And why use plastic containers? Because metal rusts, paper and cardboard gets wet and glass is more dangerous if it falls out of the cupboard. Remember that certain perishable food items can become very unsafe in only a short space of time if you’re outside on the boat in direct sunlight and on a hot day. Therefore, coolers are essential. It’s better to have at least two and perhaps more depending on the number of people on board. In one, you could keep all the food items which are perishable and in the other you can keep canned or bottled drinks, for example, as you’ll be thirsty on a hot day in particular and the drinks cooler will be getting opened and closed a lot so you’ll want to keep your food separate. Don’t forget to pack your cooler with lots of ice or frozen gel packs and that all food is kept in watertight containers or zip lock bags that will not allow any water from the melting ice to get inside. 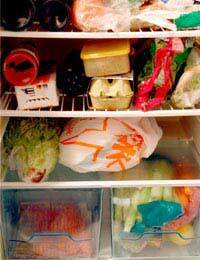 Another good idea is to freeze certain items if your journey is longer before your trip and then put them in the cooler before you go. Even certain sandwiches, cooked meats and the likes of fresh milk can be frozen but obviously make sure things are totally defrosted before you attempt to eat or drink them and that the items are suitable for freezing.